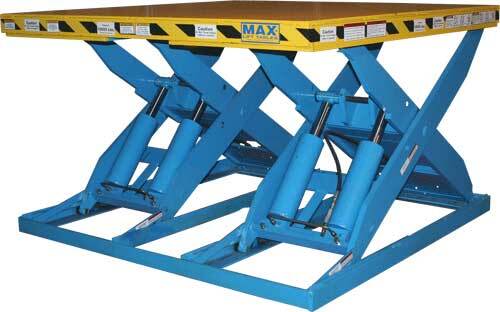 Tandem Lift Tables are designed to increase the platform lengths and widths as well as the capacities possible. 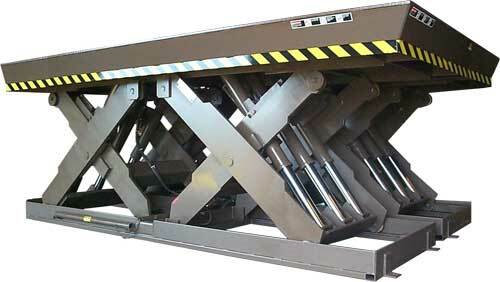 Double wide and double long lifts can lift up to 85,000 lbs. Quadruple lifts can lift up to 135,000 lbs. Commonly used for managing heavy steel or paper coils, moving sheet metal stampings or dies, and work positioning tasks. Double Long 2,000 - 85,000 lbs 12" - 120" 6.5" - 21.625" 24.25" - 135.25" 24" x 72" 120" x 264"
Double Wide 2,000 - 85,000 lbs 12" - 120" 6.5" - 24.875" 48" x 36" 24" x 36" 186" x 96"
Quad 20,000 - 135,000 lbs 12" - 120" 12.5" - 24.875" 36.5" - 135.5" 84" x 122" 96" x 420"